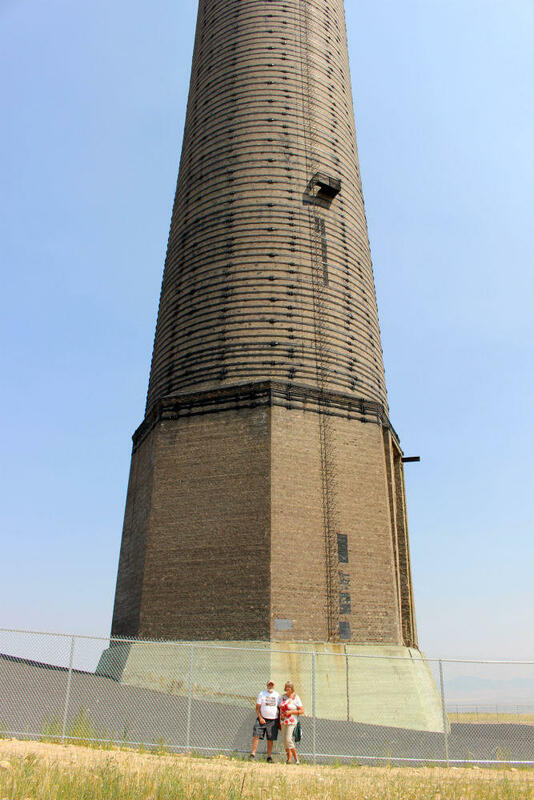 Public tours of the Anaconda Smelter Stack are being offered to celebrate the stack's 100th anniversary. August 9, 2018. It’s a steamy afternoon, and I’m sitting at the back of a packed school bus next to William Shegina. 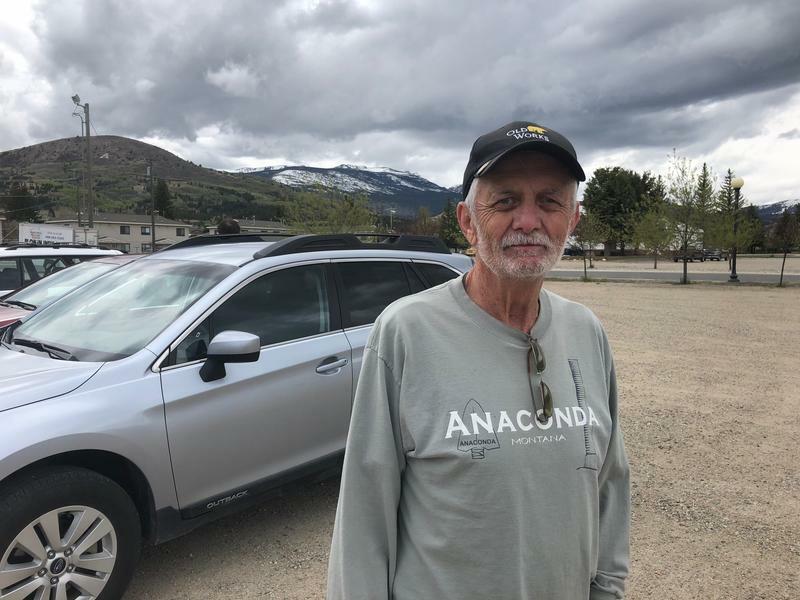 Wezy is 63, and he, like many other Anacondans his generation, got a job at the smelter right out of high school. “You’d be in your pomp and circumstance, and then go to work the next day at the smelter,” said Wezy. He was a laborer, working there summers to pay for college. That was in the mid seventies. “It’s been 40 years since I’ve actually been to the stack,” Wezy said. That’s because it’s been off limits since 1980, when Atlantic Richfield, which bought out the Anaconda Copper Mining Company, stopped all smelting operations, and started tearing them down. Wezy’s friend, Kurt Wyant, was an engineer on the demolition crew. As we snake up Smelter hill, he says with sadness that there used to be a city up here. But what is still here is a lot of toxic waste. Smoke spewing from the smelter during the copper boom contaminated the air, land and water with heavy metals. The 300 square mile area around the Smelter was named a Superfund site in 1983, and it’s still undergoing cleanup. Looking out the bus window, Wyant gapes at the big gashes in the ground. 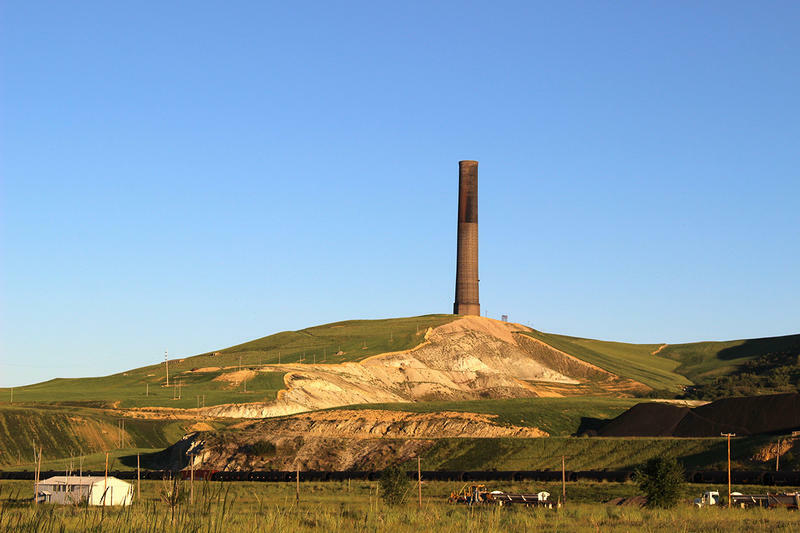 But while the rest of the facilities on Smelter Hill were demolished, the stack lives on. “Welcome to Anaconda Smoke Stack, and the centennial," said Tom Forwood. We’ve finally arrived at the top of the hill, and Tom Forwood is gathering people in front of the immense brick tower. He’s with Montana Fish, Wildlife and Parks, and manages Anaconda Smoke Stack State Park. “The people of Anaconda spoke out that they wanted this to remain. It was a really big deal for the community," Forwood said. 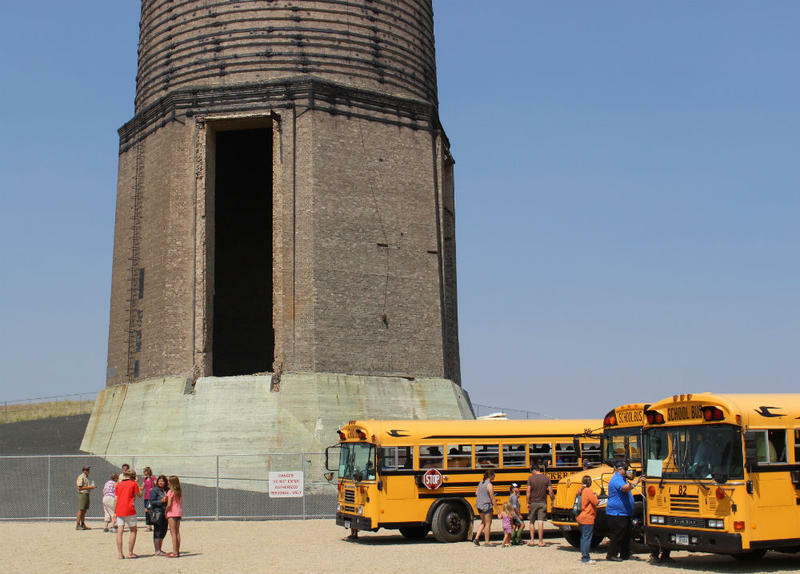 The stack preservation committee lobbied the legislature to save the stack and make it a historic monument, and worked with FWP and Atlantic Richfield to open it to the public on its 100th anniversary. Seeing it up close again was a big moment for ninety year old Don Loranger, who was dressed up in a bowler hat and vest. 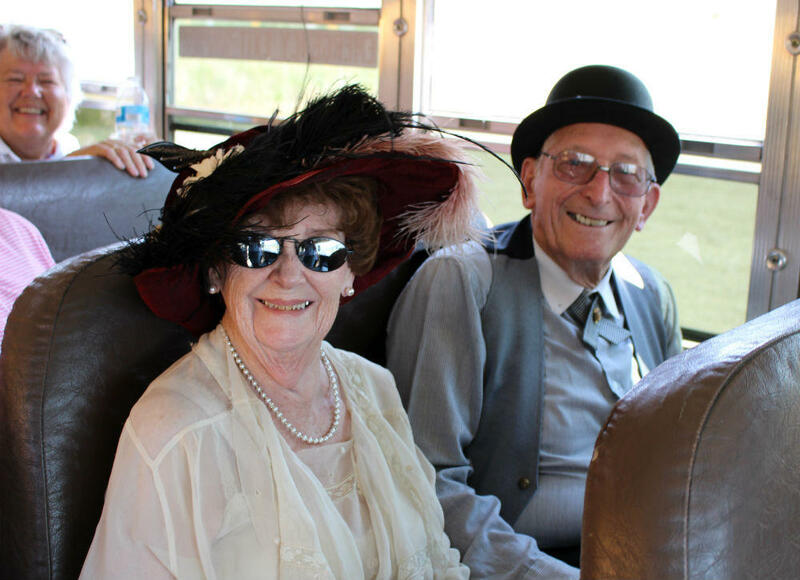 Virginia and Don Loranger were dressed up in period garb to celebrate the stack's centennial. Don has not seen it since he stopped working there in the 1960s. August 9, 2018. “I have worked right in there, knocking arsenic off the chains that were inside there in 1949,” said Loranger. He says inside the stack, there was over a hundred miles of hanging chains, six inches in diameter, charged with high voltage electricity. "It would attract the arsenic. And then they’d shut the high voltage off and you’d reach in there with the bamboo poles and knock the arsenic down into these bins and then they’d haul it away," said Loranger. I asked him if he wore protective gear back then. "You could wrap in the gauze and wear a mask, but I don’t know, people hesitated to wear the mask because it was hard to breathe then," Loranger said. "So then you’re sucking in, and say the heck with that - let it hang here. Anyways, it was quite an experience. I’m glad I did it, there’s a lot of memories now." Loranger did two stints at the smelter, first in the 1940s, and then again in the sixties. DON LORANGER: "Yeah I’ve never been back. It’s been so many years. NS: This is your first time back since you worked here? Walking around the perimeter, I bump into Tom Pozega and his wife Joann. He also worked at the smelter, and wore a lot of hats. Literally. 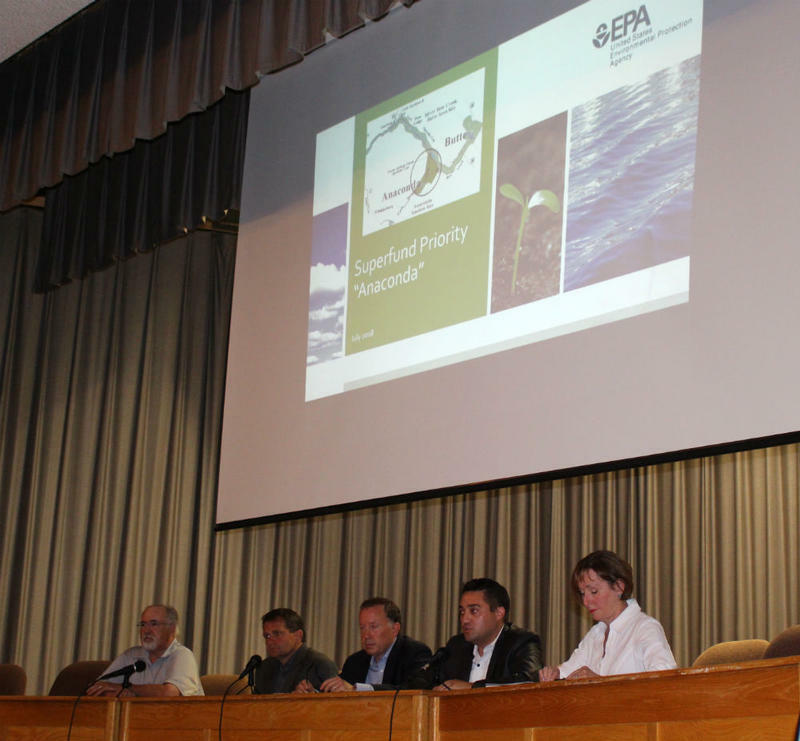 “Oh I did everything from a laborer, I was a tapper, slag runner, I worked at the tram, worked at the tailings department, and I finished up as a pipefitter," Pozega said. That was in just 12 years, towards the end of the smelter’s life span. “This was a great place to work. It supported a lot of families. Sent a lot of kids through college. But it was a dirty no good hellhole," said Pozega. He said he even back then, he was aware of the health hazards of the job. There was so much physical evidence. Even so, he said if the smelter and stack were still going, he’d be right back up here. Tom and Joann Pozega stand in front of the Anaconda Smelter Stack, which is 585 feet tall. August 9, 2018. The change of ownership, and the Superfund site designation, have affected the community’s access to the old smelter site over the last few decades. Locals and employees were used to coming and going freely. Now, there are fences keeping people out, and away from the cleanup, for liability reasons. I continue my circumambulation and find Kurt Wyant, the guy who was on the wrecking crew. He’s staring up at the tower, remembering the time he tried to climb it. KURT WYANT: Not good. I got up the foundation and about thirty feet and I looked up, and I was like, Whoa. Straight Down. NS: You got thirty feet up there? KW: Up the stack. Plus I did the foundation. And then thirty feet up the stack. NS: Just climbing on the bricks? KW: No there’s a ladder on the other side. They cut it off. But then you could just hop on it and go. Thirty feet up the stack sounds high, but it’s only a fraction of the 585 feet structure. The size is something Calvin Trainor, who’s a local in his fifties, says you can’t appreciate just looking at it from the road, in town. “This is totally awesome. You gotta be up here to see how big it is. They say you can put the Washington Monument in here, but I think you can put two Washington Monuments in it, looking at it," said Trainor. He said he came on the tour because he wanted to see the stack first hand. “You know I’ve never seen it. I hear stories from the old timers, and I wanted to see it now, before you can’t see it. In case the state takes it away, or whatever," Trainor said. The state isn’t currently planning to take it away, but FWP and the "Anacondans To Preserve The Stack" committee are trying to figure out how to keep paying for its maintenance. It costs more than $5000 dollars a year to light the stack to keep airplanes away, which is a lot for a little state park with no revenue. But Margie Smith sees the success of these centennial tours as a sign of hope for the stack’s future. “I’m delighted. I’ve had a lump in my throat for three days," Smith said. She was a leader in the movement to save the stack from destruction, and is also a major force behind these tours. Chatting with her back down at the bottom of the hill, she says they’ve already sold several thousand tickets, and the interest from the community keeps rising. “In 1983 we knew it could happen ... But now it’s changed, as of yesterday. This is a hundred years now and people are just involved," Smith said. The centennial celebrations for the Anaconda Smelter Stack continue this weekend. For more information, click here. 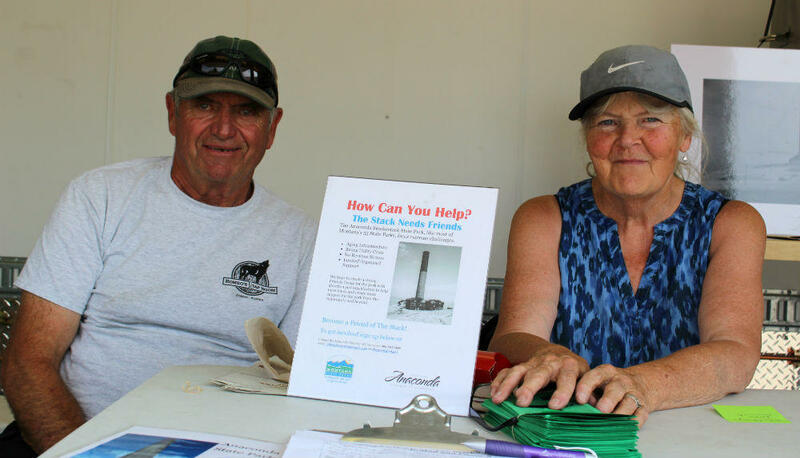 Pete and Margie Smith help sell tickets for the Anaconda Smoke Stack centennial tours. August 9, 2018.